The plan for today was to meet up with Chris and she would take us around to a few different places that were important for the family. Hermy came along too as we needed 2 cars. Dad and mum went with Chris and Christopher, Cass and me went with Hermy. We were told it would be a one hour drive but it definitely ended up being far more than that. After about an hour and a half we started asking each other where we were as even Hermy was struggling to work out where Chris was leading us. She would take us one way, then another, then another, then back the second way, I didnt really bother me that much, I was just looking out the window getting hungry. We did eventually make it somewhere. 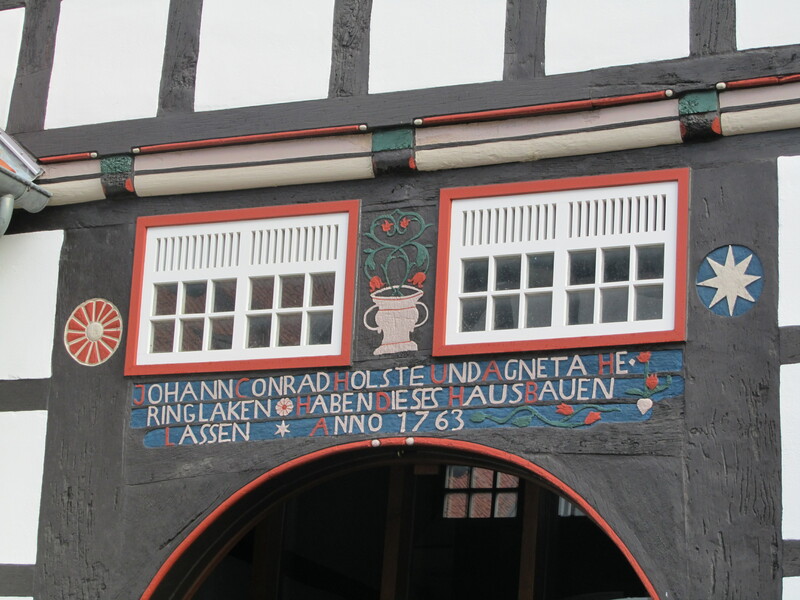 A small place called Blomburg. This is where one of the earliest of our relatives lived and are well-known in the area. We also have a statue in the centre of the town dedicated to one of our relatives from the 1400’s who was burnt at the stake for being a witch but then later one (as in 400 years later) it was realised she wasnt actually a witch and then the statue was erected and she was cleared of all charges. Better late than never i guess. 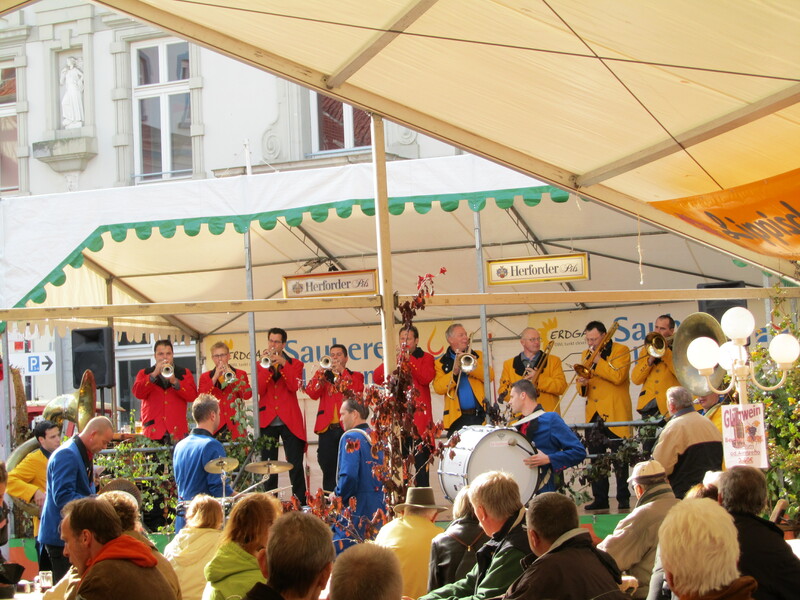 It also just happened that that weekend was Blomburgs annual “Kartoffelfest” which translates to “Potato Festival”. It is a huge event for the people. They had tents set up in the centre of town with beer and food and man choirs and brass bands and potatoes for all. It was a great atmosphere. Even though it was raining a lot, the main tent was packed. We hung around for maybe an hour in total, just absorbing everything, before exploring more of the town. There were just lots of really nice old houses in the centre and it was fantastic. Above many of the doors was writing that would usually say something along the lines of the year it was built and the names of the inhabitants. I don’t know if the names were the current people living in the house or the builders but I would like to assume they were the original owners of the house. So much history in those houses, I just can’t even imagine. After wandering for about half an hour, we went back to the cars and started heading in a direction. This car ride was way more fun as Hermy was helping me and Cass speak German better. We learnt the pronunciation of words better and so many new phrases but I can’t remember half of them. We ended up driving to Minden which is a town I visited with Joel last time. I have some family there but Chris isn’t talking to them at the moment so we didn’t meet them again. The main attraction is a huge statue on the top on a mountain next to the town. 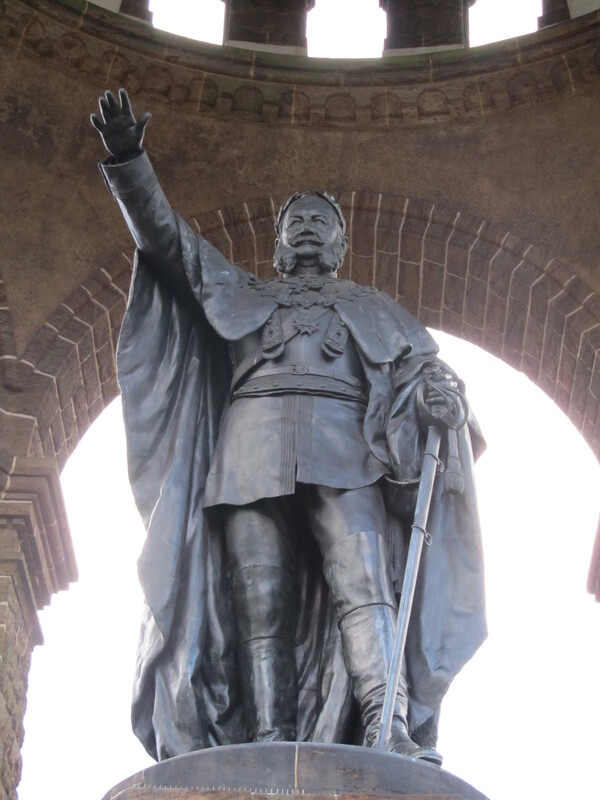 It is of Kaiser Wilhelm I, The first emporer of Germany. The thing is huge with a view over the whole surrounding area including towns and rivers. Last time, we couldn’t see anything. It was so foggy, visibility was down to about 10m-30m so the fact that this time it was relatively clear meant i was able to enjoy it so much more. When we came down from the hill, we went into Mindon itself, to the house where Chris grew up. It is still in the family but is used as a dentist clinic. She gave us a quick tour before we all went off to the shops to get groceries for dinner. When we got back into the car, we swapped drivers. Chris jumped into Hermy’s car and Chris (my little bro), Cass and me got into Chris’s car. This meant that dad could have a go at driving on the WRONG SIDE OF THE ROAD. I sat in the front with him just trying to help. he said the hardest hard is staying in the right spot on the road and not drifting in the lanes too much and also turning right as it is really tempting to cut the corner to close. He also kept grabbing the door to change gears which could potentially be a problem. But seriously, he did very well. I think the whole think would be impossible if the foot pedals were back to front though. You can’t re-teach that. When we got home, Chris cooked up our dinner which was this strange, minced meat like thingish. I don’t know what it was. Tasted ok, just really weird texture. Kind of like haggis (which is pigs intestines or stomach). Again we stayed for a while chatting, longer than the previous night, before heading back to the hostel for a well earnt rest.